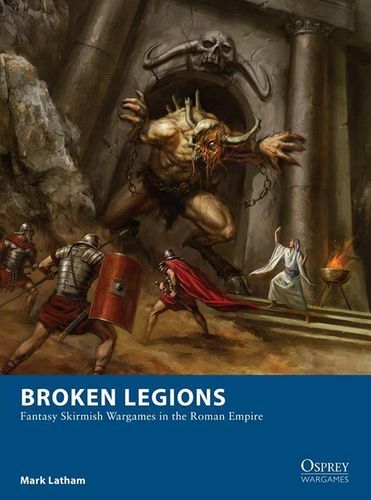 I bought a copy of the Broken Legions skirmish rules at MOAB convention. I really like the theme of "weird" ancient Rome where the Emperor (whoever is in power at the time) is involved in clandestine attempts to locate powerful artefacts, with skirmishes, not recorded by historians, taking place in the far reaches of the empire. My theory was that this was a hard fighting force - no tricksy magic stuff. Everyone had a melee level of 4, and were heavily armoured. Again, no druids or magic using, just a straight fighting force, albeit the huntsmen can shoot with deadly longbows. In two games against the barbarians (commanded ably by Martin), I found them very hard to break. They have a special rule where every one fighting gains increasing attack bonuses as more figures fight. As they also outnumbered the Argonauts, they could get late charges in to gain further bonuses and first attacks. However, I could have used some of the special hero abilities better (such as "To me, Men!") to try and get the jump on the enemy. If I was to play against the barbarians another time, I might try the Settites again, and give everyone the ability to shoot, and damage the barbarians from a distance before the melee starts.